Plan ahead for winter safety! Being prepared for a winter emergency is as easy as one, two, three! Be Aware - Local radio and television stations provide official up-to-date information during an emergency. Remember these tips when you go out to play. Avoid long periods of exposure to severe cold. You increase the risk of frostbite or hypothermia. Dress in layers of clothing and wear a hat and mittens. Get inside if you start to shiver, feel tired, or if you lose feeling in your nose, fingers, toes or earlobes. These are signs that you might be experiencing hypothermia and frostbite. If your neighbor is elderly or dependent on life-sustaining or health-related equipment make plans now to ensure their needs are met during severe winter and power outages. Help them stock a home disaster kit. Check on them after a storm or power outage. Make sure they register as a special needs customer with their utility. Notify local emergency responders such as the fire department. Have a list of emergency numbers readily available for them. Make sure you are using your wood-burning stove, fireplace and heater safely. Keep curtains, towels and potholders away from hot surfaces. Test your fire extinguishers and smoke detectors, regularly. Plan an escape route with your family should a fire happen. Carbon monoxide is a colorless, odorless gas created by car exhaust, home heating systems and obstructed chimneys that claims about 1,000 lives in the United States each year. Symptoms of carbon monoxide poisoning include sleepiness, headaches and dizziness. If you experience the symptoms of carbon monoxide poisoning get into fresh air immediately and call 911 for emergency medical help. Skin may feel numb and become flushed (red). Then it turns white or grayish-yellow. Get to a warm area. Cover affected area with something warm and dry. Get the person to a doctor or hospital as quickly as possible. Seek emergency medical assistance if your body temperature drops below 95 degrees. Remove wet clothing, wrap yourself in warm blankets and drink warm liquids until help arrives. Have your heating system (including chimney flues) checked by a professional annually. Caulk and weather-strip doors and windows to keep cold air out. Install storm windows or cover windows with plastic from the inside to keep cold air out and warm air in. Clean gutters. Frozen water in gutters can damage your home and pose a safety hazard. Replace batteries of smoke, heat and carbon monoxide detectors. Locate and insulate pipes near outer walls, in crawl spaces or in the attic. Make sure you know how to shut off the water, in case pipes burst. Disconnect garden hoses and shut off and drain water from pipes leading to outside faucets. Let hot and cold water trickle at night from faucets located on outside wall. Open cabinets to allow heat to get to un-insulated pipes near outer walls. Make sure heat is left on and set no lower than 55 degrees (Fahrenheit). Have someone check your house daily to make sure the heat is still on to prevent freezing or to shut off the water system (except indoor sprinkler systems). Turn off or unplug lights and appliances until service is restored. Before installing, be sure to properly disconnect from your utility electrical service. Have your generator installed by a qualified electrician. Run generators outside, downwind of structures. Never run a generator indoors. Install carbon monoxide detectors. Do not exceed the rated capacity of your generator. Overloading your generator can damage it and may cause a fire. Follow the manufacturer's instructions. If you must drive during a winter storm – preparation is key! Stock your car with blankets, a shovel, flashlight and batteries, extra warm clothing, tire chains, battery booster cables, quick energy foods and brightly-colored cloth to use as a distress flag. Make sure tires are properly inflated and have adequate treads. What do I do if I Become Trapped in my Car? Make sure your exhaust pipe is clear of snow. If you have access to a mobile phone or two-way radio contact emergency services. Run your engine for short periods of time to stay warm. Keep your window open slightly to allow circulation. Move arms, legs, fingers and toes to keep blood circulating and to keep warm. 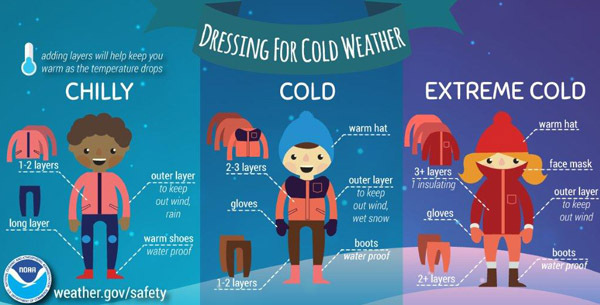 Wear loose, lightweight, warm clothing in several layers. Mittens provide more warmth for your fingers versus gloves. How can I Protect my Pets? Ingesting anti-freeze can be fatal for your pets. If you spill some, soak it up immediately. Pets that live outdoors should be fed a bit more in the winter (they need the extra calories to stay warm). Always have fresh water (consider a bowl that prevents the water from freezing). Pets can get frostbite easily on the ears, tail and paws – be aware of the temperature. Check your pets' paws to make sure ice or road salt is not building up between the toes. Keep your pet on a leash around open water or unstable ice. Hypothermia can set in quickly and the dog may be unable to get out of the water. When starting your car, honk your horn to make sure an animal has not found a warm spot to sleep under your hood.